Is Mike McCoy the Right Coach for the San Diego Chargers? At the end of the 2012-13 NFL Football season, the San Diego Chargers decided to part ways with Norv Turner. The relationship with Turner and the Chargers fan base had been severed as many felt as if Turner walked into a very talented team left behind by Marty Schottenheimer. Schottenheimer was fired after winning 14 games and being one game away from the AFC Championship game. During the first few seasons, Turner was in Chargers won the division and went to the playoffs. As years moved on Turner saw his record get progressively worse and the Chargers ended up missing the playoffs for several years in a row. When Turner was let go many Chargers fans were left wondering what the front office of the Chargers would do. That question was answered very quickly when they hired the offensive coordinator from the Denver Broncos, Mike McCoy. Today, many Chargers fans are left wondering if this is the right coach for the job. Mike McCoy has been an offensive guy since becoming a coach. He spent many years with the Carolina Panthers with Jake Delhomme before moving to the Denver Broncos. Interestingly, prior to one season with Peyton Manning most would agree that the Denver Broncos did not have the best offense in the AFC. Some would argue the Denver offense was downright bad. So much so that they had to start Tim Tebow at quarterback and win games with their defense. Even though this was the case the San Diego Chargers felt as if he was the man for the job. AJ Smith was the general manager for the San Diego Chargers through the rise and fall over the last decade. Many felt as if AJ was way too controlling of the team. When he interviewed a coach that wanted to control a certain part of the organization AJ went another way. In fact, he was actually nicknamed the “Lord of No Rings” because he was able to spot amazing talents such as Antonio Gates and Philip Rivers but he was never able to put a full team and coach staff together that could win a Super Bowl. After the Norv Turner debacle, the San Diego Chargers let AJ Smith go as well. The fact that AJ Smith would not be doing the interviewing for the new San Diego Chargers head coach position made many feel as if they would go out and get a coach that wanted to control certain aspects of the team. A common name that kept coming up was Jon Gruden. When all was said and done they went with Mike McCoy who does not seem like a coach that wants to run the entire organization. We are still waiting to see if this is good or bad. I personally feel as if the San Diego Chargers need a more controlling coach like Bill Parcells or Jon Gruden. The Chargers have had a very weak team over the last few years. There is not much intensity and they tend to get pushed around. Some people relate this to the overall atmosphere of the city of San Diego and the fans. I have been to several games in San Diego and the fans are not the best. They have other options like plenty of beaches and golf. To get Qualcomm Stadium full during any game on Sunday there have to be some fans from the away team in attendance. This filters through to the organization and some of the players on the field. This is not the atmosphere that Pittsburgh or Green Bay has when it comes to the NFL team in each town. Mike McCoy did not start his coaching career with a team that had a strong football history. The Carolina Panthers were a newer organization and fans in Charlotte were still learning about the team. The Denver Broncos have a much stronger football tradition as they won Super Bowl championships with John Elway. It will be interesting to see how Mike McCoy tries to change the culture of the San Diego Chargers. 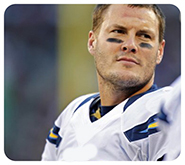 Interestingly, Philip Rivers is a very emotional guy that has a passion for the game of football. Even when I was in college I could see Philip change the atmosphere of a team that was not known for winning. I have quite a bit of knowledge about Mr. Rivers as we were very good friends at NC State in the early 2000s. Philip Rivers is one of the most emotional quarterbacks in the NFL. In fact, some would argue that his emotions sometimes get the best of him. While at NC State from 2000-2004 ACC fans knew that Philip was going to talk the talk but, most of the time, he backed it up. He holds many ACC passing records and still holds the most touchdowns in a career at NC State and in the ACC. During his first two years in the NFL, he sat behind Drew Brees and learned from watching. As soon as he got a chance to start he was immediately successful. He went to the playoffs his first few seasons in the NFL and he was throwing for 300 yards a game what seemed like every game. His first season as a starter the Chargers went 14-2 and won the AFC West division. Unfortunately, after that season Marty Schottenheimer was let go. Not only was Schottenheimer let go but offensive coordinator Cam Cameron was let go as well. The Chargers brought in another offensive mind as head coach in Norv Turner. During Turner’s first few years in San Diego Philip Rivers thrived. He made the Pro Bowl and led the NFL in passing yards. Unfortunately, the San Diego Chargers front office let many of his favorite wide receiver targets go. It was also the case that the Chargers running game disappeared as LaDainian Tomlinson was getting old. This allowed defenses to focus on Philip Rivers and his stats started to suffer. He threw way too many interceptions and the Chargers found a way to lose games in the 4th quarter. This was the main reason Norv Turner was let go and Mike McCoy was brought in. Some have wondered if Mike McCoy would help Philip Rivers get his confidence back. Through the first few weeks of he NFL season, Philip Rivers has played much better but the Chargers are coming up just short when it comes to winning games. In all the early season games the Chargers have had a chance to win in the 4th quarter but they have only been victorious versus the Philadelphia Eagles. In all reality, the Chargers were better than the Tennessee Titans and the Houston Texans but they did not get the wins. Philip Rivers is not throwing as many interceptions and he is back to his old self when it comes to throwing for 300 or 400 yards a game. This is interesting because the Chargers still do not have a dominant wide receiver in which Rivers can go to in a crucial situation. Unfortunately, the San Diego Chargers are in the same division as Peyton Manning. When Peyton Manning came to the Denver Broncos most Chargers fans knew it was going to be tough to win the AFC West. The Broncos offense looks amazing this year and they are already a few games ahead of the Chargers. Unless the Chargers start winning these close games or Peyton Manning has his arm fall off it is unlikely the Chargers are going to win the AFC West in the 2013-14 season. 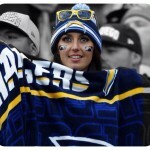 Most San Diego Chargers fans do not expect this team to win the Super Bowl this season. That said, they would like to see this team improve and not lose games in which they are more talented than the other team. Once of the big arguments against Norv Turner was that he lost games in which the Chargers had better players than the opponents. He was also known for losing games early in the season and having to go on long winning streaks at the end of the season just to have a winning record. While the Chargers have not started the season great in 2013 they are still playing better than they did under Norv Turner at the outset of the season. Having been a Chargers fan long enough I have become accustomed to the Chargers playing very bad at the beginning of the season and putting themselves in a terrible position. 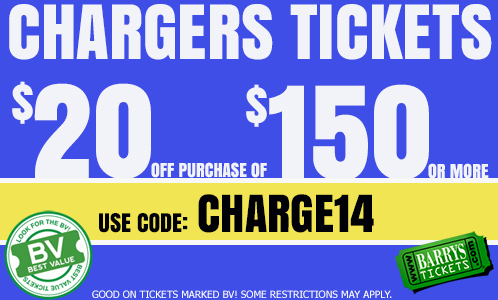 You can purchase Chargers Playoff tickets for both home and away games. I have also noticed that the Chargers are not turning the ball over as much this year. Philip Rivers threw way too many interceptions in the past two years and the running backs often fumbled in key situations. If the Chargers can play fundamental football and live up to their potential Mike McCoy might be just the right guy for the coaching job.